The MP653 is powered by a 65hp turbo charged Kubota common rail diesel engine. Clean running and fully compliant with Stage IIIB (Tier 4F), this intelligent, high performing engine is fully linked to the electronic over hydraulic transmission system. Allowing operators and supervisors advanced support and control to make the most of the power and deliver consistently high results in all conditions. • Maintenance Free Direct Drive Decks - Offer the widest width of cut in class at 3.5m (137"). • Automatic Assist Drive modes - Help all operators deliver a consistent finish no matter the conditions. • Pin Protected Supervisor Menus - Allow fine tuning of travel speeds and quick diagnositc features for immediate fault finding and less downtime. • ISO Mounted Operators Platform - With a high specification suspension seat provides a superior view of the work area and puts the controls right where you need them. 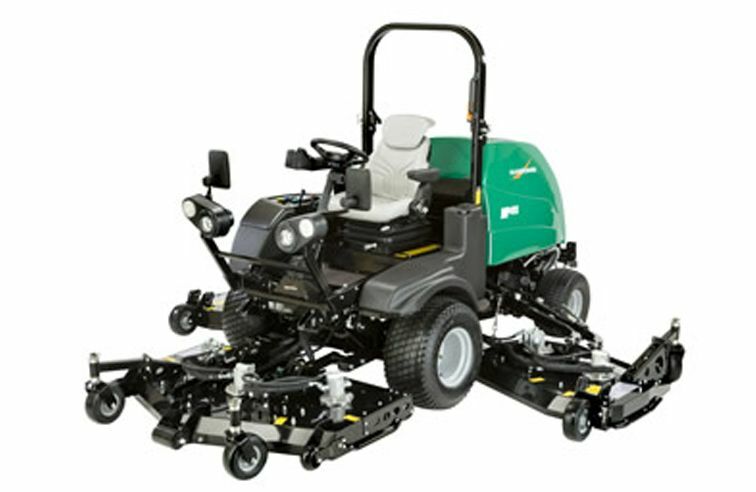 • Narrowest transport width in class - Allows this mower to go places others simply can't. • Suretrac 4WD - Parallel-cross-series flow ensures superior traction when climbing or cutting side slopes. 12-volt, input/output controller. 45/60 amp alternator. Overload protection with automotive type fuses. Hydrostatic closed loop parallel cross series SureTrac system; variable displacement piston pump; front high torque fixed displacement piston wheel motors; full time auto 4wd fwd, on demand in reverse. 13.3 gal capacity reservoir, O-ring face seal fittings, 10 micron remote charge filters, suction screen at tank, oil cooler side by side radiator, diagnostic test ports. 50.2 l capacity reservoir, O-ring face seal fittings, 10 micron remote charge filters, suction screen at tank, oil cooler side by side radiator, diagnostic test ports. 118" or 129" or 137"
Fingertip operated joysticks for individual deck lift/lower; cross cut position; front deck service position with lock pin.